Thomas Pfarr is a longtime aircraft modeler, but also flies this DJI Phantom quadcopter to take photos. 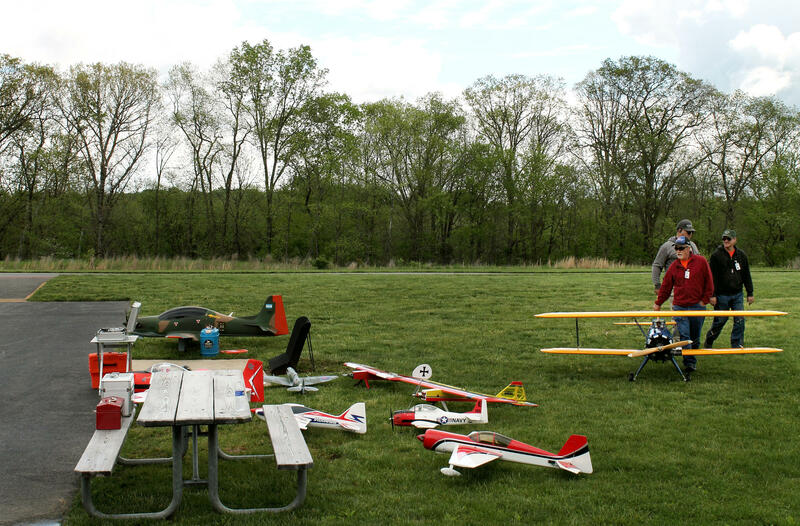 Model airplanes cluster near the runway on a flying field in Boyds, Md. "These basically fly themselves; they're all computerized," Thomas Pfarr says about drones like his DJI Phantom quadcopter. Ribbons of tickets trade hands for a drone raffle. It's DC Drone Day on a field in the part of western Maryland where suburbs give way to parks, rolling hills and farmland. The field is a weekend hangout spot for a group called DC/RC, one of several local clubs for people who are into flying things; specifically, pilots of radio-controlled things; even more specifically, aeromodelers. Aircraft modeling is a decades-old hobby that counts tens of thousands of followers in the country and has seen its share of changes in technology. Drones arrive as the latest revolution, and aeromodelers are sizing it up with a sense of both intrigue and apprehension — like staring down the new guy at school who's got the cool kicks and somehow, keys to all the secret parts of the building, but sometimes does incredibly stupid things that ire the gym teacher into making everyone run laps. Except in this case, that could mean new regulations. The District of Columbia itself is a no-fly zone, but a dozen flying clubs from surrounding areas — including DC/RC ("RC," as in "radio control") — hosted DC Drone Day, a sort of drone appreciation event. On the DC/RC field, a narrow road slices into a vast grassy range and stubs into a picnic area. To the left is a mini-runway. A cluster of model airplanes crowds one end. Two remote-controlled planes thread the overcast sky with high-speed loops and barrel rolls. Their deep, waning engine yawns meld with the chirping of birds. To the right is a plot of grass designated for model helicopters — and now also their cousins, the drones. There, alone, is Thomas Pfarr. His quadcopter hovers above, buzzing like a giant wasp. "I'm the club photographer," says Pfarr. His drone is up in the air filming the escapades of others. Pfarr pops the trunk of his SUV. During the day, he helps build giant space telescopes, like the famous Hubble and now its successor, the James Webb. In his spare time, he builds and flies aircraft models. Pfarr got into flying as a kid, going out to neighborhood baseball fields to launch control-line planes. You maneuver a cable tethered to a plane, a bit like a kite but with far more mechanics and speed, and the aircraft flies in circles. "I couldn't afford back then any of the radio-control equipment; it cost more than a car," Pfarr says. "A thousand dollars back in 1960, you could buy a Volkswagen for that." The aeromodeling hobby has undergone numerous technological metamorphoses over its 80-plus years: Radio remotes replaced line controls; electric engines overtook gas and jet ones; and the aircraft got lighter, cheaper and easier to fly. Now, Pfarr is into flying scale replicas of warplanes, but he also has a soft spot for the fun stuff, like electric foam planes. "We actually have a contest where we shoot paintballs at them to try to knock them out of the sky," he says. Through the opened trunk, Pfarr's SUV looks overtaken by a giant oblong construction, maybe 8 feet long, painted red and silver with a "Western Air Express" logo. "Every part on here is handmade," Pfarr says. The plane is 30 years old and he has rebuilt it. Before the creation of plane-building kits or "almost-ready-to-fly" aircraft — in which as little as a few screws can stand between opening a box and enjoying the flight — this was a crucial skill. Months or years had to be spent constructing models from wood: acquiring plans, cutting, shaping, assembling. The aircraft in Pfarr's trunk is a vintage scale replica of the biplane that made a 1926 mail run from Los Angeles to Reno, Nev., and now rests on display at the Udvar-Hazy museum in Virginia. Another, venerable craftsman had created the model all the way from its blueprints; Pfarr spent six months restoring it, mostly its mechanics. "There's no manufactured item on it," he says, "other than the engine." I ask Pfarr how many models he has scratch-built in his lifetime. "Not that many," he replies. "Maybe 20." In the distance, Andy Kane spins a propeller of his Stearman biplane, a one-third scale model, kick-starting its engine by hand. What Pfarr says about Kane is this: "He can just fly anything, at any moment, at any time without any issue, and you just say, 'How the hell does he do that?'" Model aviation enthralled Kane so much as a teenager that he got licensed as a general aviation pilot, logging more than 1,800 hours and spending 30 years in Civil Air Patrol. "When you're flying that model and you're standing on the ground, you imagine yourself being inside that plane. That's where the thrill is for me," Kane says. Miniature aircraft fly like the real thing — wind gusts, turbulence and all. "Of course, takeoff is is the second-greatest thrill," Kane says. "Landing is the first." When recreational drones came onto the market, Kane was intrigued, and even got a commercial license to use one quadcopter for gutter inspections in his day job as a heating and air-conditioning contractor. Their latest promising draw, he says, is first-person-view obstacle racing. But at their most basic, the very things that made drones a mass hit subtracted from their excitement for many RC veterans. Takeoff and landing happen with a click of a button. Two simple controls and an app can be enough to direct the flight, much of which is automated and computer-stabilized. "You're operating a device; you're not really flying," says Kane. "As a photographer it's great," says Pfarr. "From a flying point of view, it's absolutely boring." The drones' comparatively low learning curve is also at the heart of perhaps the modelers' biggest misgivings. For eight decades, aviation enthusiasts have been flying at local Academy of Model Aeronautics clubs like DC/RC — with their mentorships, insurance and safety rules that predate even the formation of the Federal Aviation Administration. All of a sudden, fly-by-night drone rookies started taking to the skies whenever and wherever they wished, often aimlessly, and landed, constantly, in the headlines. "Honestly, I could see it right away," Pfarr says. "The idiots are going to kill us." The Academy of Model Aeronautics says about a quarter of its roughly 190,000 members fly multirotor aircraft, those quintessential drones. As drone sales climbed, the organization had a choice: sideline the scene ("Airplanes aren't drones!" say some of its members) or embrace it ("Get with the times!" say others). For years, AMA members have inhabited a special legal niche: Congress has all but shielded aviation hobbyists from FAA regulations as long as their "unmanned aircraft systems" are flown purely for recreational use, as part of a "nationwide community-based organization" (read: AMA) and in compliance with that group's safety guidelines (don't fly above 400 feet, near airports or over people, etc.). But what if, one day, that legislative caveat disappeared? "Unmanned aircraft systems," as defined by the FAA, does not distinguish between a hand-crafted warplane replica, a glider aircraft or a decked-out racing drone. The distinction lies in the purpose of flight. And, as it stands now, any aircraft — including a quintessential drone — is "model aircraft" when it's flown recreationally within the appropriate safety code. "It's almost impossible to separate ourselves from [drone pilots]," says Rich Hanson, AMA's government and regulatory affairs representative. "So we think the best strategy is to try to educate them and bring them into the fold." And so — even if many drone fliers think of themselves closer to photographers or gadget enthusiasts than aircraft modelers, and even if some RC old-timers remain separatist — AMA is embracing drones as the latest adjunct to the hobby. For one, it's the likely new generation of members. AMA's membership grew from about 139,500 in 2010 to roughly 164,600 in 2013 and then to nearly 187,700 last year. The organization doesn't attribute all the growth to drones, though, but also to increased marketing. For another, modelers say uneducated, rogue drone pilots give the hobby a bad rep — or worse, prompt new restrictions. "There isn't a tension," says Pfarr, about drone fliers and aeromodelers, "other than the tension that, if these are used and cause trouble," he glances toward his drone, "it's only trouble for everybody else." Earlier this year, the FAA began requiring federal registration of all "unmanned aircraft systems" over half-a-pound in weight. 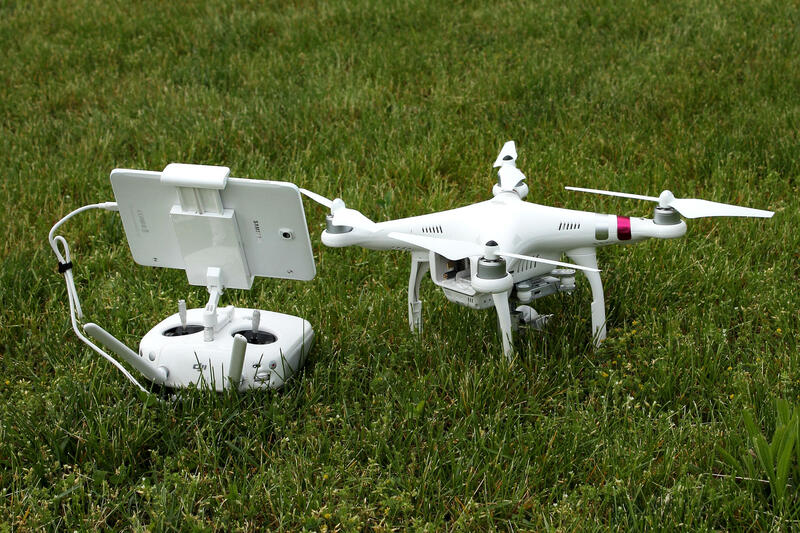 States and cities are weighing geographic drone restrictions. This legislative session alone, Hanson says, some 200 to 250 pieces of legislation in some form address drones. RC veterans' biggest fear is that the push to restrict drone flying zones would cost them their flying fields. And Hanson worries about too many regulatory obstacles alienating young people interested in aviation. In 2015, AMA's spending on federal lobbying (though still teeny by Washington standards) jumped to its highest in six years, according to the Center for Responsive Politics. Often, Hanson says he raises concerns about a proposed bill or ordinance, only to hear: Oh no, we don't have a problem with modelers, we worry about those drone guys. "We've not been on anybody's radar, so to speak, for decades," Hanson says. Drones and owners who don't realize they're pilots "have inadvertently, or consequently put us on that radar." This summer, new federal rules for small "unmanned aircraft systems" are expected to draw the lines of allegiance starker yet: Recreational drone fliers may either join a "community-based organization" like AMA and abide by its safety rules, or go solo and face up to the FAA.